Times are tough, so why not sell your body? Wait, come back, it's not what you think. Creative advertising executives, who may or may not have been ingesting too much of the stuff that made advertising such a frenetic industry, are looking at ways in which members of the public can hire themselves out as walking billboards. Tattoos are probably a little de trop unless you want to be part of a lifelong campaign, but facial hair offers an arresting, very visible and strictly temporary canvas for ad slogans. With so many hipsters affecting a Taliban-wannabe look, advertisers with an eye on the Portland-Williamsburg-Shoreditch-Hoxton market could do worse than pitch their message at chin height. That's the thinking behind the Kentucky-based advertising agency Cornett-IMS initiative to clip small ads into mens' beards. 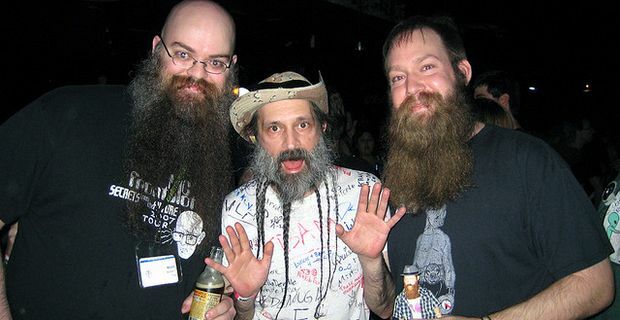 Their own hype for what they call "beardvertising" is predictably excitable. "Do people stare at its awesomeness? Of course they do," their website suggests. Cornett-IMS executive Whit Hiler told Business Insider that the company have been besieged with interest from hairy-chinned advertising shills around the world, desperate for a slice of the action and willing to sell their chin-hair space to the highest bidder. "I think it’s the next big thing," Hiler said, obviously mistaking "next big thing" for "latest desperate attempt to grab some publicity". "Everybody loves beards," he added, erroneously. "‘We’re getting a ton of emails from guys with epic beards that want to host beardboards and we’re actually in talks with some brands that want to be Beardvertisers. I think we’ll probably be seeing some beardboards in the wild before too long." Well maybe. Like most advertising, ultimately it all comes down to price. It turns out that the agency are offering just $5 a day to beardvertisers. At that price only the most desperate hirsute hipster is going to be interested.